Don Bennett thanked last week’s bell ringers for the Salvation Army. $371.09 collected last weekend. He needs volunteers for the 22nd from 2-4. Holiday party is Saturday Dec 15 from 4-8 at Ennisbrook. If you have questions, please contact Julie Joy Stilwell. Thanks to everyone who has delivered dictionaries. Julie Joy Stilwell shared some cute thank you notes. At next week’s meeting, bring donations for the Unity Shoppe. The Kule club will perform. If you can deliver the pink guitar from Fiddlers’ to the winner, please contact Steve Boehm. Past President Joe Weiland thanked Liz Werhane for taking the club newsletter, The Bugle, online with the creation of The Blogle. Joanne Schoenfeld Orenstein presented the student of the month to Jackie Campos. Her parents and teacher were there to support her. She will be returning to San Marcos High School next year. Catherine McKee of the Red Cross wants to come to the club and encourage more members to participate in or support the Red Cross. The board thanks us for our continued support. District Foundation Gala will be Jan. 25 at the Holiday Inn Goleta. Register online. The theme is peace. The speaker is a past RI director. 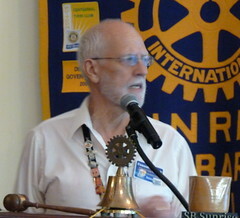 Rotary Steps on Poverty on January 26 at UCSB. The price for the 2013 RI convention increases on Dec. 15. It’s a good time of year to make your donations to TRF and the club’s foundation. 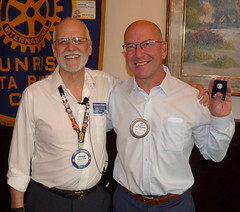 David Velarde, David Vo and Tom Heath (sponsor) inducted Claude Saks as a new member. His classification is coffee importing. Rendezvous was at Cafe Stella last week. Tomorrow’s rendezvous is also at Cafe Stella at 5:30 PM. Lee is an attorney with Ambrecht & Associates. A lot of U.S. laws come from England, including wills. Church and state disagreed about inheritance law. King preferred primogeniture — estate goes to oldest son. If someone did not have an oldest son, the property went to the crown. Church preferred people to leave their estates to whomever they choose because then the church could get some of it. Feudal lords would appoint someone to manage their property and collect dues from people while they went to the crusades. Sometimes they would come back and the caretaker would not convey the property back to the crusader. Courts often sided with the crusaders. Soon the caretakers became known as trustees and the crusader the beneficiary. Will – document that disposes of your assets at your death, public record. Trust – like will, but a living trust is not a public document. Trusts have become more popular because of the privacy. JP Morgan and Rockefeller had their wills published publicly (not by choice). 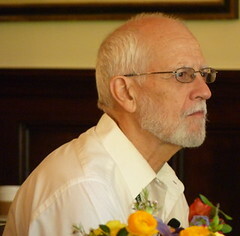 He also shared stories of the Kennedys, Elvis, Michael Jackson and Huguette Clark. Dynasty planning helps you plan for more than just the next generation. One reason to do this is the estate taxes. First generation takes the tax hit, and the subsequent generations don’t. It also helps with asset protection. Joint Revocable Trust: most popular trust used by spouses. Put assets into trust. First spouse passes away. Surviving spouse gets assets in survivors trust. Other half of estate will either have a marital trust that would be funded enough to avoid an estate tax or a family trust. Surviving spouse dies and everything dumps into trust for kids. Irrevocable life insurance trust: allows you to have insurance proceeds received by the family while not being included in your estate. Otherwise, the insurance money could be heavily federally taxed. Note: must create trust before getting the life insurance. Put money into trust (enough to pay insurance and ongoing premiums). Trust pays the insurance costs. Estate tax-free. It gets a little more complicated. Ask Lee. What is the $ amount where it starts to make sense for qtip or dynasty plan? About $5.1 million for each spouse. Next year, anything over $1 million may have 55% estate tax.